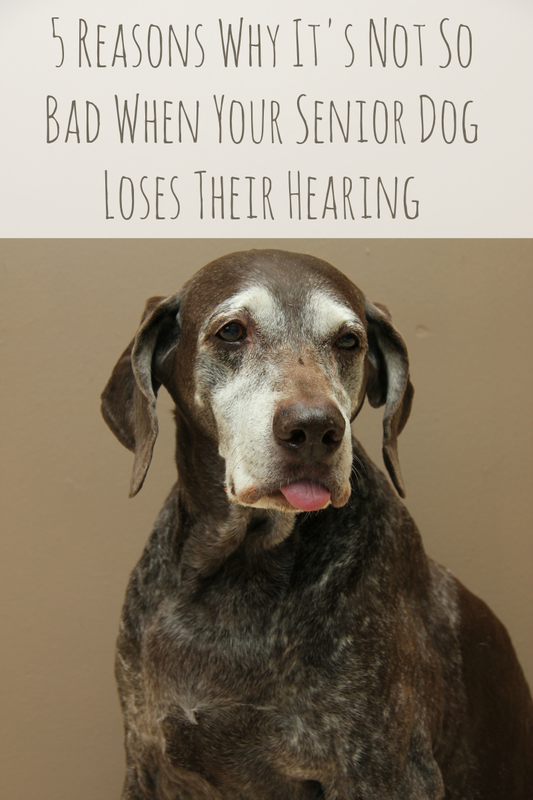 For many senior dogs, it's a common occurrence to lose some or all of their hearing. For the past year, Shiner's hearing ability has noticeably declined. Now, it's apparent that she can't hear most sounds unless they are really loud. Sometimes, it does bother me. Like when I want to grab her attention by calling her name, but she doesn't even notice. Her recall was not great before, but now I don't even bother calling her to come inside. I'm much better off putting on my shoes to round her up back into the house from the yard. In light of things, I started thinking about all the good reasons why it's not so bad when your senior dog goes deaf. I'm not saying that I'm happy about it, but just trying to embrace this new stage in her life. It's really not the end of the world, after all. Now, we just do things a little differently. 1. She doesn't get scared or worked up by thunderstorms or fireworks anymore. Shiner wasn't always nervous during thunderstorms, but her anxiety during them grew just a little bit as she aged. She was just more clingy during them and wanted to be close to me. Also, in the summer time here the baseball field across the street always has fireworks every Friday or Saturday night. She'd hear them sometimes and get all worked up barking and groaning and carrying about. Now, she doesn't even bat an eye to these scary noises and sleeps peacefully during thunderstorms and fireworks. 2. No more barking at every little noise she hears. If Shiner were to hear a noise that she found unacceptable, she would immediately jump off the couch and bark really loud. 95% of the time, the noise turned out to be nothing. But her barking was a good way to wake me up or anyone else that might be asleep in the house. These days, Shiner barks at noises much less than she used to. She just isn't hearing the noises anymore. I can say hello to more quiet sleep and less interrupted naps for my daughter. 3. She can sleep more peacefully. I've never seen my dog sleep more peacefully than she does now that she's lost most of her hearing. It's like she's knocked out. I can make all kinds of noises and she doesn't stir one bit. It must be nice to get some good rest in. 4. New ways to communicate. Because Shiner can no longer hear my commands, I have to find new ways to communicate with her. It's a challenge sometimes, but it's also a wonderful bonding experience. When I trained Shiner basic commands - sit, shake, lay down, and stay - as a puppy, I used hand signs with them. Thankfully, even though Shiner probably cannot hear me speak these commands she can still identify what I want her to do with hand signals. 5. She wants to be with me all the time. This one does have its ups and downs, but it's nice to feel loved. As Shiner has aged and lost her hearing, she becomes closer to me and seems to want to be where ever I am most of the time. Have you ever had a senior dog with hearing loss? Tell us about them in the comments! 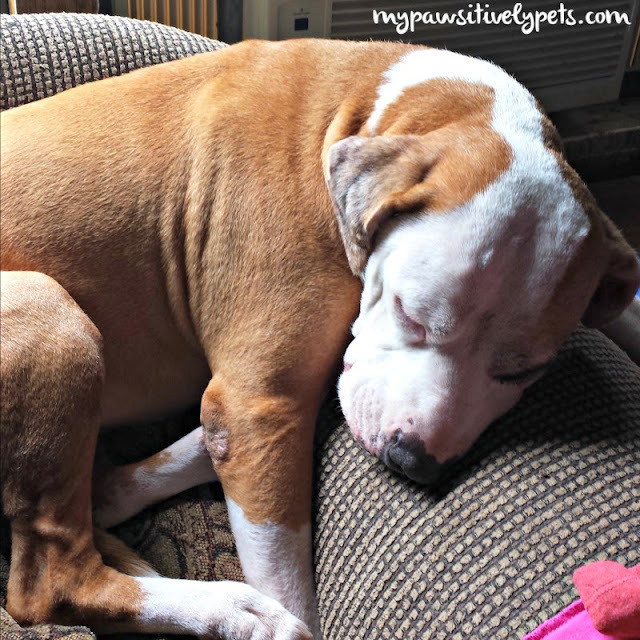 Our Katie has lost some hearing and no longer fears thunderstorms, and sleeps like a log! She still barks because Bailie and I bark and howl so loudly it wakes her up and she joins in. We would rather she lose hearing than sight. A log is a perfect description for it! BOL! I agree that I'd rather her lose hearing than sight. Her sight still seems fine to me. This was a very interesting post Ann. I never thought about hearing loss. I'm wondering now if this is a standard test for senior dogs, or do you have to request it. Good for you teaching Shiner hand commands. When Harley ignores me, I know it's not from lack hearing, she's just tired of hearing me! I'm not sure about the testing, but I know how our vet used to check for hearing loss and recommend owners check for at home. When your dog is sleeping (or you can sneak up behind when they are awake) go behind them and clap your hands really loud or make some sort of loud noise. If they hear it, they should react to it. If not, they may be losing their hearing. Yep, that was a great list. When the dogs that were hear lost their hearing they also enjoyed NOT hearing the fireworks. This was interesting. And nice to take some positive views on something as fragile as old age. Yes my dearly departed dog enjoyed not being able to hear fireworks. I remember taking him to a parade as an old dog and realizing that he was having a lot more fun than he used to have because he couldn't be upset by the sounds of the hustle and bustle. I was going to add that my dog figured out how to use a full length mirror that we had on the wall opposite our bed. We had the TV on the same wall. Throck could watch TV with us, but he could also keep tabs on us through the mirror. We could hand signal from behind him, and he would respond. That is really cool! I would have never thought of a mirror. Well, it's nice to know that not being able to hear isn't a disadvantage. We're glad Shiner seems to be coping well with it. Aww, such a sweet article! And so true - it's what my mom always commented about when her dog (my "growing up dog"!) lost his hearing. He was a very tough little terrier, king of the neighborhood, but when he lost his hearing he relaxed so much and no longer told off the dogs he didn't like. She felt he was much happier in many ways. That's sweet. :) Shiner seems a little more dopey than usual sometimes with her hearing loss. It's cute and funny, but she definitely seems more relaxed too. She used to bark at the workers next door from the window a lot when they were being loud, but she hasn't done that in a while now I think. So true! Is it considered to be hearing loss if the dog selectively hears things? :) Harley is choosing what to listen to in his old age, but I love him to pieces anyway. Shiner you are such a beautiful girl, I think its great that this only brings you and Mom closer to one another. I had a similar experience when my dog Agatha lost her hearing. And not only did she want to be closer to me, she kept a closer eye on me when we were separated. It was a big help. The only problem we had was that at 16 years old, her eyesight was nearly as bad as her vision. I would have to jump up and down and wave my arms to help her see me when she got confused and couldn't find me. Aw poor girl... I haven't noticed any sight loss yet with Shiner. She really doesn't act that old, except for the hearing loss thing. And maybe she sleeps more often too. Definitely some great reasons and a perfect example at why hand signals are great! For every new command or trick I teach, I pair it with a new hand signal. I didn't even think about what would happen if she loses her hearing, but I'm happy we'll still have a way to communicate! ....N while itz suspected I can still "hear" vibrationz....if that makes sense.....hearin de vaccuum masheen iza thing oh de past....that pluz dai$y's whinnin !!! Haha! Well not hearing that vacuum monster mustn't be so bad ;) Shiner is not scared of that thing, but she's still troublesome with it. She will sometimes try to get it while I'm vacuuming but she hasn't really done that lately. Very interesting ; do you need to be more careful, to be sure that she can see you to avoid Shiner of being surprised as she cannot well hear you approaching her ? I think so, maybe just a little bit. She's never really been so startled that she would try to bite or anything like that. It's just a oh hey - there you are! excited type of expression lol. Anonymous comments are disabled due to large amounts of spam. Thank you for understanding! 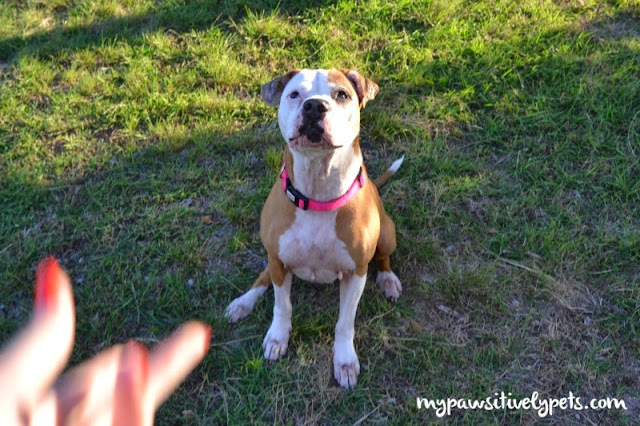 All content shared at Pawsitively Pets is written by Ann Staub unless stated otherwise. The information provided here is meant to be informative. This website is not meant to diagnose pet health problems, treat conditions, or replace veterinary care. All opinions shared here are our own and may differ from yours.